A story that sings — or stings? 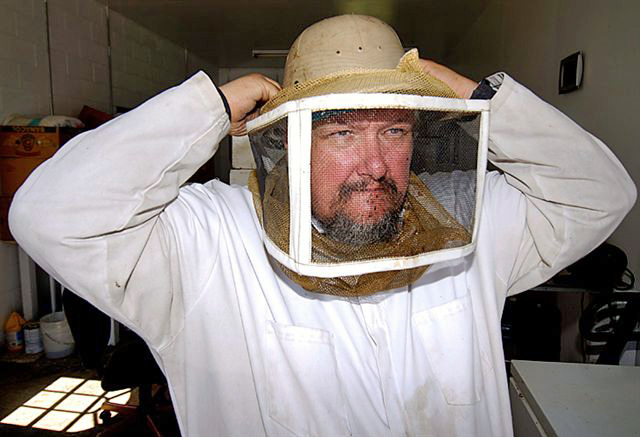 Beekeeper Mitch Markovich puts on his protective gear. Photo: Submitted. It was the 1970s in Aliquippa, and Mitch Markovich liked his Honda motorcycle and the two neighbor girls down the street, but he didn’t like bees. The tiny black-and-yellow honey-makers scared him, but the Rogish sisters loved honey about as much as they liked riding on Markovich’s motorcycle, which is to say, quite a lot. “’Well, if you’re going to marry any of my daughters, they like to eat honey; you’re going to have to keep bees,’” Markovich recalled the words of the girls’ father, Miles Rogish. Begrudgingly, Markovich agreed to catch bees with the old well-digger the next time there was a swarm — thinking the old man would forget. This entry was posted in Point Park News Service and tagged Akasha Chamberlain, Aliquippa, Aliquippa Pennsylvania, Beekeeper, Bees, featured, Honda, Makes and Models, Markovich, Motorcycle, Point Park News Service, Recreation by Andrew Conte. Bookmark the permalink.